* Presenters’ PowerPoint presentations will be available soon. Brilliant Darkness: Hotaru in the Night and Light of the Genji began with the premise that if one wished to preserve life on the planet, it would be important to interweave aesthetic and ethical responses whilst respecting cultural differences. We saw in responses to the Fukushima disasters that fears related to the night were not confined to American culture, but they were expressed quite differently from one side of the Pacific than the other. For that reason, we created a set of bi-lingual films that sought to overcome public anxiety over naturally lit nocturnal environments using a cherished and multi-cultural icon, the firefly. The films present top firefly researchers from Japan and the United States, through the tireless efforts of Director Emily Driscoll. Drs. Obha, Lloyd and Branham each provide insight into the science relating fireflies and light, putting the artistic inquiries of photographer Rei Ohara into arguable context. The love of fireflies is used to offset anxiety of the night, which hinders the exploration and actions necessary to combat the real ecological challenges related to luminous habitat degradation caused by light pollution and made evident by scientific inquiry. In just over a century since the invention of the electric light bulb, broad swaths of the planet have been transformed from experiencing a natural pattern of light and dark determined by the sun, moon, stars and occasional other transient lights, to being subjected to intermittent and perpetual illumination from human civilization that is unprecedented in the history of Earth. The pervasiveness of this phenomenon and its exponential growth should merit recognition as a global change: a planetary-scale change in the Earth system. The results of recent research have extended knowledge about the geographic scope and specific impacts of artificial night lighting on animal behavior, physiological processes, and ecological interactions across a range of taxa, and its broader ecosystem effects. Karen Trevino, who heads up the Natural Sounds and Night Skies Division for the National Park Service, will offer an overview of the division, provide a history of the NPS Night Skies Program, describe what the program does and how it serves the national park system, review the division’s current priorities, and provide examples of park specific projects, partnerships, and regional and system initiatives. While the effects of night lighting on mammals and their habitats seem obvious, they remain difficult to quantify. By reviewing laboratory and field studies on mammals since 1943 we were able to summarize the potential effects on ocelots and their potential prey. These studies suggest that the installation of permanent and temporary night lighting along the U.S. / Mexico border may result in impacts to ocelots and their potential prey. We provide an overview of ocelots and their habitats, discuss the effects of artificial night lighting on mammals, review the border infrastructure installed as part of Operation Rio Grande during our study period, and document ongoing border infrastructure installed along the U.S / Mexico Border within and adjacent to ocelot habitat. While the effects of night lighting on mammals and their habitats seems obvious, they remain difficult to quantify. By reviewing laboratory and field studies on mammals since 1943, we were able to summarize the potential effects on ocelots and their potential prey. These studies suggest that the installation of permanent and temporary night lighting along the U.S./Mexico border may result in impacts to ocelots and their potential prey. We provide an overview of ocelots and their habitats, discuss the effects of artificial night lighting on mammals, review the border infrastructure installed as part of tOperation Rio Grande during our study period, and document ongoing border infrastructure installed along the U.S./Mexico border within and adjacent to ocelot habitat. Change in day length is an important cue for reproductive activation in seasonally breeding animals to ensure that the timing of greatest maternal investment (e.g. lactation in mammals) coincides with favorable environmental conditions (e.g. peak productivity). However, artificial light at night has the potential to interfere with the perception of such natural cues. Following a five-year study on two populations of wild marsupial mammals exposed to different nighttime levels of anthropogenic light, we show that light pollution in urban environments mask seasonal changes in ambient light cues, suppressing melatonin levels and delaying births in the tammar wallaby. These results highlight a previously unappreciated relationship linking artificial light at night with induced changes in mammalian reproductive physiology, and the potential for larger-scale impacts at the population level. Every year, tens of thousands of people are injured in more than 1 million wildlife-vehicle collisions on roads. In addition to the loss of life, these collisions come with a tremendous monetary cost (over $1 billion per year) and influence wildlife community dynamics from genetic diversity to population size. Light levels have often been discussed as potentially influencing wildlife behavior near roads, though this has not been rigorously tested. To understand the role that light at night plays in wildlife movement across roads, I analyzed a ten-year dataset of puma radio-collar movements in concert with collected data on roadside light to identify perceptual landscape features associated with frequent crossing areas; I also assessed the light landscape at control locations. Because crossing structures can be expensive and difficult to build, providing tangible approaches to assessing the ideal crossing locations into the future may be beneficial to reducing wildlife mortality on roads. Further, minimizing characteristics of roads that repel wildlife from the roadway are critical for making crossing structures more attractive while keeping wildlife away from undesirable road areas. Portland enjoys a reputation as one of the greenest cities in the nation, a city where we measure livability by our access to parks and greenspaces, gather in the thousands to watch Vaux’s Swifts funnel into a local chimney roost, top our buildings with 80,000 square feet of ecoroofs annually, and ban projects that increase oil trains passing through the city. Audubon Society of Portland has worked for decades to preserve on the ground habitat for wildlife, and today, our BirdSafe Portland campaign is raising awareness about building and lighting hazards to birds in the urban landscape; educating architects, designers and planners on bird-friendly building design and lighting practices; and lobbying city planners to integrate bird-friendliness into city policies, plans, and codes. The rush to convert to LED poses a new challenge as Portland hastens to convert the city’s street lights to 4,000 Kelvin luminaires. We have significant work to do to ensure that as Portland grows, our measures of sustainability in the built environment integrate bird-friendly building design and responsible lighting practices. Each year millions of migrating birds collide with communications towers. However, lighting towers with only flashing lights at night reduces the numbers of bird collisions by as much as 70 percent and still maintains safety for aircraft. Lighting changes can be accomplished at minimal cost to tower owners and simultaneously reduce maintenance and energy costs, resulting in the most effective and economically feasible means of achieving a significant reduction in bird collisions with communications towers. Before technological advances in street-lighting, animals evolved to time their biological rhythms with the predictable rise and fall of the sun. Therefore, contemporary increases in light exposure may introduce a strong selection pressure for individuals, species, populations and communities of birds. Using house finches (Haemorhous mexicanus) in Phoenix, AZ we tested the hypothesis that urban finches, which are exposed to light throughout night, are more resilient to its effects than rural finches, which are further from its influence. Specifically, we predicted that under constant light rural finches have increased stress and disease progression, and reduced sleep compared to urban birds. Overall, our results suggest that birds may rapidly adapt or develop resistance to shifting photoperiods, and underscore how important these mechanisms (or lack thereof) are for conserving global biodiversity due to the broad geographic reach of light pollution. Our luncheon keynote speaker was featured recently on CBS News in which he was referred to as “the Angel of Darkness” because of his efforts to make the Big Bend region of Texas one of the darkest spots on the globe. For the past 25 years, Bill Wren has worked with city councils, county governments, utilities, media representatives, and businesses across west Texas to control light pollution. His tireless efforts have raised awareness and helped protect the entire region from the spread of artificial light at night. Bill has made continuing astronomical research possible at the University of Texas McDonald Observatory, defending millions of dollars of investment. 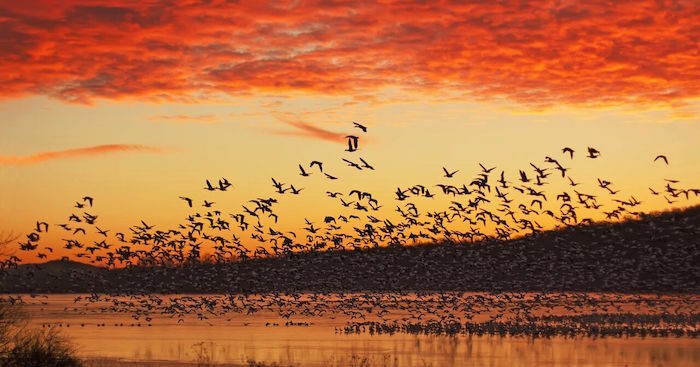 Through Bill’s tireless commitment to the cause, scores of laws and zoning ordinances have been adopted to protect the nighttime environment for both citizens and our fish and wildlife resources. Bill’s lunchtime remarks will focus on continuing efforts to work with the oil and gas industry to adopt best practices for lighting their nighttime activities. As oil shale and other petroleum-rich substrates are increasingly targeted for production across the United States, it will be essential that the ecological impacts of flaring and other sources of artificial light at night associated with oil and gas development are mitigated and reduced. It has long been known that artificial light at night (ALAN) can deter nesting female sea turtles and disorient their hatchlings. Boca Raton, FL has proven to be an excellent field laboratory to study ALAN sky-glow impacts on sea turtles because it is located in a very urbanized area with half of the linear beachfront comprised of unlit park areas. Development increases significantly immediately south of Boca Raton resulting in more sky-glow in that direction. Applying a technique known as the “hatchling orientation index” to the crawls of sea turtle hatchlings from emerged nests allowed us to determine the overall direction the hatchlings took to the ocean. Results from this nesting season showed hatchlings from Boca Raton beaches approached the ocean in a more southeast direction than hatchlings from less developed areas, that took a more direct route to the ocean. This indicates that the more intense sky-glow from major cities south of Boca Raton may be influencing the sea finding capabilities of hatchlings that are not considered to be disoriented by lights. Additional studies using GPS locations of sea turtle nests and non-nesting emergences demonstrated the importance of beach width and dune height on the behavior of nesting females. Data collected in the past 15 years show that sea turtle nesting activity in Boca Raton is shifting from parks areas to nesting habitat in front of large (tall and wide) beachfront condominiums. These buildings shade the beach from the sky-glow of the development inland, creating more desirable nesting habitat. Probably all reptiles are sensitive to light, which in various species is perceived by means of lateral eyes, a parietal eye that communicates with the pineal gland, and other possible photoreceptors including the skin. Light that affects the parietal eye (or organ, sometimes called the “third” eye) regulates circadian rhythmicity, thermoregulation, hormones, immune function, and reproduction. Light sensitivity in reptiles extends from ultraviolet through visible bands of the spectrum, and pit vipers, boas and pythons have heat-sensitive “pits” that provide imagery of surroundings by perception of infrared radiation. In essence, these receptors extend a sense of “vision” into the infrared. Behavioral studies show that UV- and visible-spectra are not only necessary for conspecific, interspecific, and intersexual recognition, but that brightness and contrast also are critical for perception of motion, orientation and foraging. Appropriate light conditions are likely very important for a sense of well-being in reptiles. Collectively, information about light provides reptiles with a “biological clock” that is geared to the lighting environment and potentially regulates many important bodily functions. Artificial light in the environment of reptiles that exhibit nocturnal behavior thus potentially disrupts important aspects of health, safety (from predators), and survival. Frogs and salamanders are impacted by a variety of anthropogenic ecological disturbances, and some populations are showing alarming declines in numbers. Many of these amphibians are nocturnal, and artificial light at night has the potential to alter behavior and physiological processes in individuals and ecological and evolutionary processes at the level of populations. As light pollution becomes more pervasive, even very small amounts of artificial light entering natural habitats can impact the activity, feeding, predator avoidance, reproduction, and growth of these animals. In this session, we will discuss the basic life history of frogs and salamanders, provide reasons why they are vulnerable to light pollution, and summarize some research that provides examples of how light pollution may impact these vulnerable animals. As a longtime IDA member and one time IDA webmaster, the issues of ecological light pollution have long been an important interest. Living in California’s Sacramental Valley, the plight of salmon and the current drought are subjects of constant reminder. For the last four years, I have focused on the issue of light pollution and salmon as well as support of local salmon habitat restoration efforts. The impact of light at night on out-migrating juvenile salmon has been documented in a number of studies, primarily in the Northwest. These important studies have focused on Northern California at the Sundail Bridge located in Redding. This conference speaks directly to issues surrounding the Sundail Bridge, its lighting, community importance and the important salmon habitat it spans. With winter and spring-run salmon and Central Valley steelhead listed as protected species and their numbers at an all time low, predation on these stocks as a result of light at night deserves increased public consideration and attention. With greater understanding of the impact of light at night on out-migrating juvenile salmon, and with community support, lighting design can have an important role in preserving this important natural resource. Light regulates the physiological and behavioral activity of many in-stream organisms. As a result, we expect, and have already seen, changes in activity and foraging patterns in aquatic insects as well as the fish that depend on those insects for food. My research is focused on 1. how ALAN might change predator-prey interactions and the foraging behavior of stream salmonids (e.g. trout and salmon), 2. how ALAN might interfere with stream restoration projects by preventing the movement of adult aquatic insects between watersheds, 3. the potential evolutionary impacts of ALAN, and 4. changes to stream community structure (which organisms are able to live in an area and in what abundance) and ecosystem functioning. Modern street lighting, at ecologically relevant intensities, had a significant impact on the timing and behaviour of Atlantic salmon fry dispersal in an aquarium and wild juveniles (smolts) migrating to sea from their natal stream. The synchronous nocturnal dispersal of fry and the diel timing of downstream migration of smolts are predator avoidance tactics. These life-history stages are of critical importance in the dynamics of salmon populations and any disruption could significantly increase predation, reduce fitness, and have a significant impact on recruitment. The dose-response for both the delay and disruption effect on fry dispersal was not linear, with a triggering threshold of light disrupted behavior apparent between 0.2 and 1.0 lux, and little additional impact seen when the light intensity was increased further. Given that a reduction in street light intensity below 1 lux is unlikely to be accepted, preventing riparian areas from being artificially lit is likely to be the most effective management option. However, any reduction in light intensity at a purposefully lit source will ultimately reduce the areas affected by that light source. In these investigations the Atlantic salmon was used as an indicator / model species. However, other diadromous fish species (e.g. eel & lamprey) and freshwater fish that bury their eggs with subsequent dispersal of fry at night (e.g. trout) may be similarly impacted. In recent years, our understanding of how artificial light at night affects invertebrates has diversified beyond “moths to the flame.” Evidence from numerous studies now paints a more complex picture of the role night-time lighting plays in shaping invertebrate ecosystems, with impacts documented across many stages of the life cycle and at multiple levels of biological complexity. In addition to the attraction / disorientation and mortality of aerial invertebrates, reproduction, larval recruitment, food web dynamics and community structure are all affected by artificial light in marine, freshwater and terrestrial ecosystems. This exchange will briefly discuss the range of documented and potential impacts of artificial light on invertebrates, with special emphasis on its extent, influence and mitigation in marine ecosystems. Moths (Lepidoptera) are important nocturnal pollinators of a diverse range of plant species in diverse ecosystems on a global scale. However, their importance and contribution to the provision of pollination ecosystem services may have been under-appreciated. Moth populations are known to be undergoing significant declines in several European countries. Among the potential drivers of this decline is increasing light pollution, which affects individual moths through a variety of mechanisms. However, the effects of existing street lights on wild communities of moths and their biotic interactions have not previously been studied. I will present results of an experiment supporting the disruptive impact of lights on moth activity, which is one proposed mechanism driving moth declines, and suggest that street lighting potentially impacts upon pollination by nocturnal invertebrates. I highlight the importance of considering both direct and cascading impacts of artificial light. Insects are indispensable to life on the planet, and depend upon the natural luminous environment for survival. Research in the photobiology and photo-ecology of fireflies demonstrates how complicated assessment of the effects of artificial night lighting can be. Light conditions the physiology, sensory ecology and activity partitioning in time and space of all animals, as a relationship fixed within processes of sensory inhibition rather than the resource or fuel as it is typically conceived as. This session presents firefly photobiology in this context, arguing that a more exacting conception of light is necessary to produce species specific solutions to the challenge of light pollution. This presentation revives notions of the photic field, as a biologically relevant form of light indispensable to understanding the role of light qualities such as polarization and frequency in the photobiology and photo-ecology of insects. The photic field enables researchers to describe scalar and vector irradiance, as well as the radiance of light produced in part by the particular optical system of the animal in question. Although these concepts can be quite challenging mathematically, this session presents the physical parameters of light in a qualitatively simply manner. LED lighting systems for outdoor lighting applications continue to evolve as do strategies to mitigate related effects upon regional astronomical and ecological assets. The improving availability and relative lumen-per-watt efficiencies of blue-suppressed low correlated color temperature emitters, narrow band amber, phosphor converted amber, and various combinations of broadband emitters and sub-550NM and sub-500NM filters allow for a wide palette of choices to be assessed to suit site-specific and task-specific lighting needs. In addition to static spectral content options, readily available luminaire designs also include precise geometric beam shape selections and adaptive controls to include dimming, dynamic spectral shifting, motion detection, and dynamic beam shaping to minimize total environmental lumen emissions throughout the course of the nighttime hours. Regional and international light pollution mitigation regulations will also be briefly addressed in the context of luminaire shielding and spectral content control efforts to better protect human quality of life issues as well as astronomical and ecological interests. The presentation will include numerous spectral content graphs for various luminaire options as well as project-specific case studies to document comparisons of legacy lighting systems versus high-performance LED systems with regard to total lumen emissions, skyglow contributions, energy efficiency, and end-user satisfaction with the installed LED lighting systems. Physical samples of various luminaires will also be available for hands-on assessments. LED Lighting: Good News Today – Bad News Tomorrow? The maturation of the LED technology has resulted in a plethora of new products in the market in a very short period of time. This technology has developed so quickly that much is yet to be learned about the proper definitions in the technology and the impact of the new light source in our lives. Recent developments related to the impact of the spectrum of the standard “white” LED are now being looked at much more critically in terms of interaction with the environment. This presentation will discuss how the new technology can offer the ability to adjust the spectrum of the LED source that in turn allows one to study the impact of the specific spectrum on the subject in question. This short talk will show that some of the fundamental definitions used for LEDs today are misleading at best and potentially harmful in the worst case and offer a pathway to redefine the methodology.